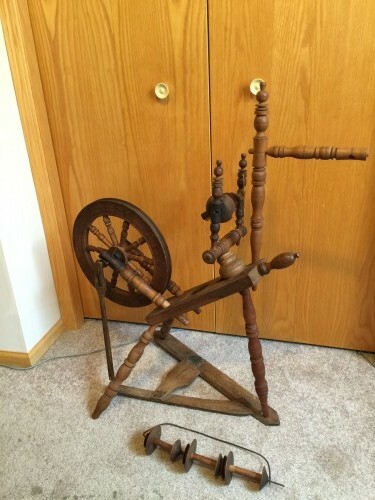 The more I wrote about spinning wheels the more I realized I didn’t know what I was talking about. Most of my knowledge about rugs, carpets and tapestries comes from books and the Internet. 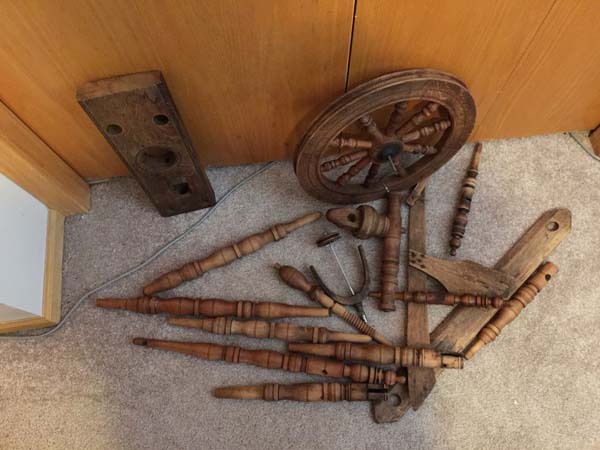 Rugs, carpets and tapestries can be found and fondled anywhere, but where the heck do you find actual spinning wheels outside of craft fairs and museums? Craigslist, of course! I didn’t go looking for antiques but I soon discovered that the new machines made for craft use were darn pricey. For that matter, the antiques aren’t going for free either. But I found this little beauty for $75 right down the street. It looks ancient. I found several that looked like it on the web; all from the 19th Century. Couldn’t find mention of its origin anywhere…I’m certain it wasn’t made in China! Check out the Cool Spinning Wheels on Amazon–a bit more up-to-date than the above! Unfortunately the gentleman I purchased it from wasn’t sure when or where he had come by it so I don’t know anything about it’s history. Maybe I’ll make up a story myself. Maybe something like it was originally owned by the first Dr. Mayo’s wife and she spun the yarn for his socks–boring! How about Mrs Mayo loaned it to Lizzie Borden so she could spin out her parents funeral shroud–bet that would boost the resale value! I wanted to tear it down and clean it as it has a bit of an oil smell. I’ve never worked with wood–much less wood that was more than a century old. I’ve worked with computers, VCR’s, televisions and monitors but my experience wasn’t much help. Breaking down the flyer was the most difficult part. It took me several hours of twisting and turning until I found the little sliver of wood that was holding it between the maidens. Then I wrestled with the little drive wheel until I discovered it needed a more modern approach–unscrewing. Who knew? I broke it down and cleaned as much of the oil off as I could; this is what it looks like now.